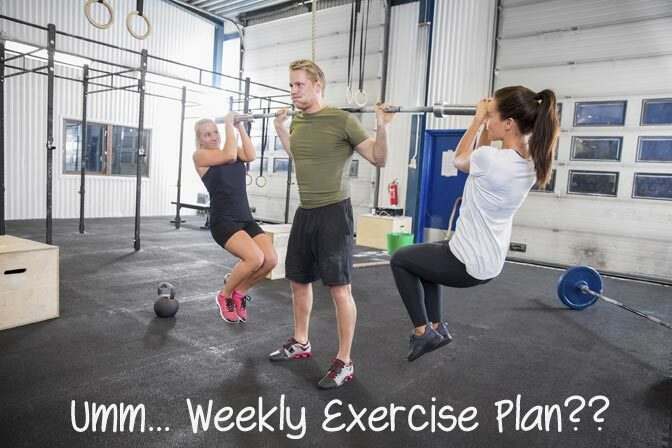 Can A Weekly Exercise Plan Be Fun Too? How many extra calories did you use up last week doing more daily movement? It’s an excellent place to focus if you want to lose weight or just prevent yourself from gaining any more. Think of new ways to add more activity into your day. • Continue to maximize your SPA (spontaneous physical activity). • Try to add at least 1,000 more steps to your daily total each day this week. Is your planned exercise starting to feel more like an integral part of your daily schedule? If it isn’t yet, it should be soon. Keep thinking of which type of exercise you enjoy most, and find a way to fit in more of that into your schedule. Remember, if you have been mostly sedentary up until last week, take it slowly to avoid getting discouraged or, worse yet, injured. This isn’t a race to the finish, but rather your long-term goals should simply be greater fitness and optimal health. • Continue your aerobic workouts, but increase them to 15 minutes of light exercise 3 days this week (preferably non-consecutive days). See the Weekly Advice and Information section below for an exertion scale. • From here on out, remember to do your warm-up exercises and stretching with each aerobic session. • Continue doing your moderate aerobic workouts for 30 minutes 3 days this week (preferably non-consecutive days). • Add in 1 day of light resistance training, doing 1 set of 12-15 reps to fatigue on 8-10 different resistance exercises (including upper body, lower body, and core exercises), preferably on a non-aerobic exercise day to prevent excessive fatigue. • Do additional stretching after your resistance work if you feel tight at all. You can learn a lot from this week’s tip about why measuring the size of your waistline gives you a much better feel for your health and fitness than watching your scale weight. Cardiovascular training, flexibility exercises, and resistance based workouts are the foundation of this exercise plan. Losses in muscle tissue and greater storage of intra-abdominal fat are highly associated with insulin resistance, but adding skeletal muscle increases insulin action. Muscle is your most insulin-sensitive (and largest) tissue; thus, doing resistance training to increase or at least maintain your muscle mass is a logical step in the management of your condition. Regular aerobic and resistance exercise, coupled with a calorie and carbohydrate-controlled diet, will help to facilitate fat loss as well, particularly the fat tissue from within the abdomen that is most damaging from a metabolic standpoint. It’s also important to remember that fat loss and weight loss are not necessarily the same thing. Initially, when you start an exercise program, you may actually gain some weight. Increases in stored glycogen (carbohydrate, stored with water), cell structures, and blood volume all contribute to this potential for a higher body weight. There’s no need to panic, though, because you will be losing adipose (fat) and gaining some muscle tissue along with these changes, which are positive adaptations to exercise that will improve your insulin action. After a few weeks of training, you may notice your weight starting to decrease, although it could take several months. Some people with insulin resistance are not overweight or obese, so weight loss won’t be a major motivating factor for them, but everyone will still benefit from increased muscle tissue and related improvements in glucose and insulin function, along with the psychological rewards and overall improvements in fitness. This week, we will try to give you a better understanding of the concept of the glycemic index, or GI, which we mentioned briefly last week with regard to the types of carbohydrates. Whether you have diabetes or just want to prevent getting it in the future, the GI idea is important. As the debate about low- versus high-carbohydrate eating rages on and dietary fads come and go, the best approach in choosing a healthy meal plan for yourself is to realize that the actual composition of carbohydrate, fat, and protein in the foods that you eat is not nearly as important as the effect that individual foods have on your blood glucose levels after you eat them. When you consume a carbohydrate, your body breaks it down through digestion and then absorbs it. The more rapidly it does so, the sooner the absorbed end products of carbohydrates (mainly glucose) get into your bloodstream, which accounts for its “glycemic index,” or GI. GI values are usually scaled from 0 to 100, with pure glucose (a simple sugar that makes up half of white sugar) being the most rapidly absorbed-its GI value is 100. If a food has a high GI value, then your blood glucose will rise more rapidly after eating it; a lower number means that the food causes less of an immediate increase. While the actual range for each GI category may vary somewhat, “high-GI” foods are usually considered to be those with a GI value of 70 or more. These foods cause rapid rises in blood glucose in everyone, but that are harder to control if you have diabetes or insulin resistance. Most of the foods in the high-GI category contain large amounts of highly refined flour or added sugars, including most ready-to-eat breakfast cereals, pretzels, sugary candy, and bread. White potatoes, though not a processed food, also fit into this list because they are digested so rapidly. To deal with the influx of glucose from carbohydrates with higher GI values, your pancreas must be able to respond by releasing a large amount of insulin to take the resulting glucose out of your bloodstream and into cells around your body. Unfortunately, most people with diabetes lack the ability to respond to these glucose spikes with adequate amounts of insulin, as do many people with pre-diabetes and insulin resistance. Other carbohydrate sources cause less of a spike in your blood glucose levels and are generally easier for your body to handle-depending on how much of them you eat. “Medium-GI” foods such as sweet potatoes, rice (white or brown), oatmeal, and white sugar have GI values in the range of 55 to 70. Any food with a GI value less than 55 is considered “low-GI”; examples are most whole fruits (since the GI value of fructose is not that high-even though it’s a simple sugar), dairy products, legumes (beans), pasta (white or whole-wheat), and nuts. One of the better breads these days is the Ezekiel bread. There’s so much to learn that can benefit your workouts and your overall health. Here’s some information that will help you gauge the intensity of your planned (or even unplanned) exercise. Exercise Intensity: When it comes down to it, there really is no right or wrong exercise intensity, but how hard you choose to work out can have differing effects that you should be aware of. Generally, harder and longer workouts are going to improve your insulin sensitivity more and for longer. The short-term effects of your last exercise session usually last no more than 24-48 hours, which means that you should try to avoid going more than 2 days in a row without doing something. Harder exercise is more likely to result in athletic injuries, though, and exercising longer than 60-90 minutes per day at a higher level greatly increases your risk. Our goal is for your exercise to be something that you adopt as a lifelong activity, and getting injured gets in the way of that. For that reason, we will also be introducing concepts like “easy” and “hard” days and “cross-training” along the way..
Talk Test: As far as monitoring your exercise intensity goes, keep the “talk test” in mind: you should be able to carry on a conversation without being too short of breath during an activity. If you’re feeling too winded to talk, then you likely are working harder than you need to for health benefits. That’s not to say that occasional vigorous exercise is not good for you (it is), but you do not need to push yourself that hard until you are ready to do so. The program is more concerned with helping you form lifelong exercise habits. Exertion Scale: You can also monitor your exercise using a subjective scale that takes your overall perception of how hard you’re working (including your breathing, muscles, etc.) into account. The number you choose should reflect how heavy and strenuous the exercise feels to you, encompassing your overall physical stress, effort, and fatigue rather than a single factor like leg pain or shortness of breath by itself. The recommended range for optimal cardiovascular fitness gains is 5 to 7 (“moderate” to “hard”) with 10 being the very hardest level. Of course, when you start out, stay at the lower ends of the scale until you are ready to move up to a higher level as any exercise can potentially benefit insulin action and metabolic control. Exercise Selection - Free Exercise Versus Weights!